Corralling the Party Barns - Blackburn Architects, P.C. : Blackburn Architects, P.C. Maybe it’s the news I seek, but I feel as if there’s an influx of articles and project profiles about converting old barns into residences, guest houses, schools, theatres — even a basketball court/recreational wonderland. Bring it on, I say. Converting an old building to a new use never gets old to an architect like me. There’s even a How to Guide (aptly titled, How to Take One Old Barn and Call it Home) from the team who can seemingly fix anything and everything: the experts at This Old House. Converting an old barn into a new home isn’t a task for the faint of heart, but big things can yield even bigger rewards, I like to think. The article touches on common issues you’ll face: structural (is it safe? how’s the foundation? ), is it energy-efficient (you can bet it’s not — yet!) and water sealed (again — no way, no how), the pluses and minuses of such a large, open space, and more. At Blackburn, we’re working to revive a metal pole barn currently used as a recreational lodge in North Carolina. While the barn isn’t centuries old, like many of the bank barns I admire, it’s an interesting challenge for my staff and me. 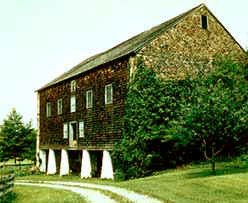 The owner would like to expand the barn’s use so that it may host business events and entertainment functions. Our goal is to respect the barn’s form and the local context, while providing a renewed aesthetic and use. Design plans include replacing the metal cladding with a painted wood or composite siding to provide a more traditional look. We’ll also incorporate more natural light into the barn through an enclosed glass entrance, which will in turn make the space feel more inviting. The floor will be lowered to increase the space’s capacity and the hayloft area will become a conference center for up to 80 people. Heavy timber framing with steel plate connections will add to the rustic yet finished interior. I’ll post updates about the project as the work progresses. In the meantime, how about some inspiration for your own conversion project? Here’s just a sample of what I’ve found lately. If you stumble upon a great adaptive reuse project (whether it’s a barn, an old warehouse, a church), I hope you’ll share it here. I can’t seem to get enough.